As Director of Falk Laboratory School, I extend to you a warm welcome to our vibrant and engaging community of learners! 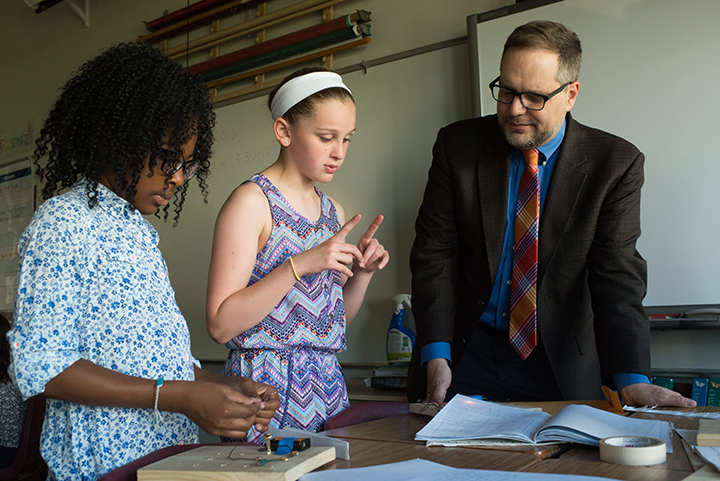 For more than eighty-five years, the Fanny Edel Falk Laboratory School at the University of Pittsburgh has been a well-respected leader in Progressive education, both regionally and nationally. Our School was born of two separate, yet complementary, wishes. In the late-1920s, the University of Pittsburgh and its School of Education wanted to establish an elementary school that would be innovative and experimental, in the manner of John Dewey’s famed laboratory school at the University of Chicago. At the same time, prominent Pittsburghers—and siblings—Marjorie Falk Levy and Leon Falk, Jr. were themselves dreaming of a school that would promote Progressive teaching methods, one that they hoped might also honor the memory of their mother, Fanny, herself a trained teacher, who had died when they were small children. Over time, these wishes were actualized, and the “little gray building on top of the hill, overlooking the Cathedral of Learning” opened its doors to its first K-8 students in the fall of 1931. Today, Falk School continues to build upon the Progressive educational legacy established by our founders. Our impressive faculty (100% of whom hold advanced degrees in their respective fields) provide students with hands-on, inquiry-based learning experiences that are second-to-none. Because our School is intentionally small (a teacher-student ratio of 1:9, 423 students total) Falk teachers know their students exceptionally well, not just as learners, but as people. Everything we do at Falk is with the greatest of intent, and we pay close attention to ever-evolving best practices in elementary education and child development. In fact, as a laboratory/demonstration school housed at one of the world's great research universities, it is critical to us that our faculty remain fresh and innovative, for they serve not just as teachers to the children in their classes, but as mentors to the two dozen or more student teachers who come to us each year through the School of Education’s various Masters programs. We are exceedingly proud of the work that we do each year with student teachers who, after they leave us, go on to work with children in public and private schools throughout the Commonwealth of Pennsylvania and beyond, carrying with them the Falk School legacy. Last but not least, our facility itself speaks to the intentionality with which we approach all that we do. Located in a beautiful spot at the highest point on the University of Pittsburgh campus, the school today is the result of a comprehensive 2009 renovation of our charming Tudor-inspired 1931 building and a multi-million-dollar Green addition completed in 2008. Seamlessly blending old and new, it provides an extraordinarily vibrant and dynamic child-centered learning space that simply must be seen to be believed. I extend an open invitation to you to visit us, for this is, without a doubt, the only way to fully experience and appreciate the infectious magic that is Falk School. We are deeply proud of our School and would love to show it to you in person. To arrange a visit, please contact our Admissions Office at (412) 624-8024. I very much look forward to the possibility of meeting you in person someday soon! "Our academic program is structured to be both intellectually engaging and nurturing. We have found that students learn best when they experience tasks that are high challenge but low threat, guided by world-class educators who are not only articulate and intellectually gifted but compassionate and caring as well. In many ways, it is the inclusive, warm, and welcoming nature of the Falk community that helps us accomplish these goals best. Our students and faculty members represent a rich tapestry of cultural backgrounds and life experiences. We view our amazing diversity as one of our School’s most important strengths as it helps prepare our children for the lives they will lead in an increasingly global and interconnected world."